Let's get back to basics. This fabric is reminiscent of the fabric used "back in the day" - you know the little calicoes you picture your Granny wearing - okay, maybe it's your great grandmother for most of you. Simple and colorful - no frills - but just enough fuss to make you look great while you conquer those everyday chores. Own the original flirty bias cut apron - don't be fooled by imitations! 100 percent cotton fabric from American Jane's Happy Camper collection for Moda is trimmed with pretty red bias trim. Sweet pinafore style apron is cut entirely on the bias for a nice drape. Apron is 29 inches in length from top of bib to hem. Tie end to tie end is approximately 53-54 inches. 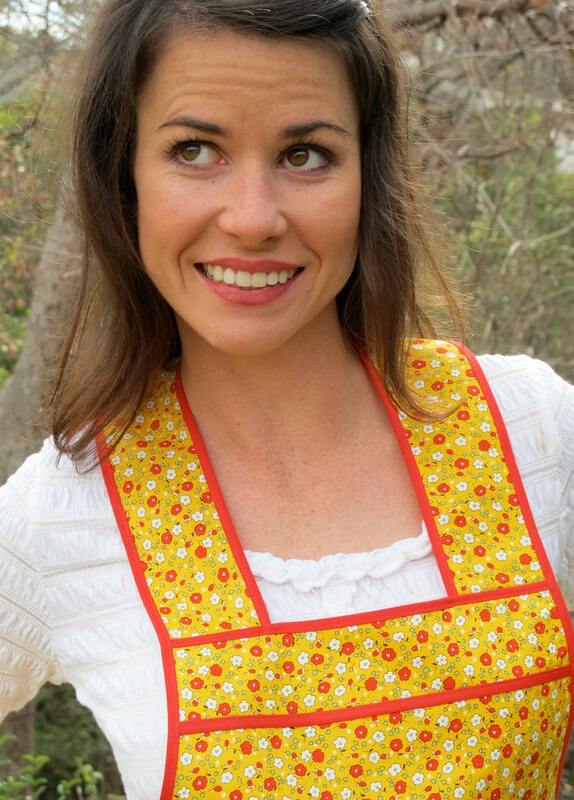 This cool retro apron is flirty, feminine, and flattering. One size fits most, but can be made in the "Next Size Up", better fitting sizes 16-18. See my profile for additional sizing information. Machine washable in cool with like colors, tumble dry low, or line dry and save energy!